Like peanut butter and jelly, equal pay and paid leave aren’t fancy concepts, they’re not luxury items - they’re basics that stand alone, but are better together. That’s the message we’re taking to Congress in the next few weeks, and we need your help! → Add your name to our letter urging every member of Congress to co-sponsor and support the FAMILY Act - the paid family and medical leave insurance act that will soon be reintroduced in Congress. The Family and Medical Insurance Leave Act (FAMILY Act) will be reintroduced soon and we urge you to co-sponsor and support the bill. 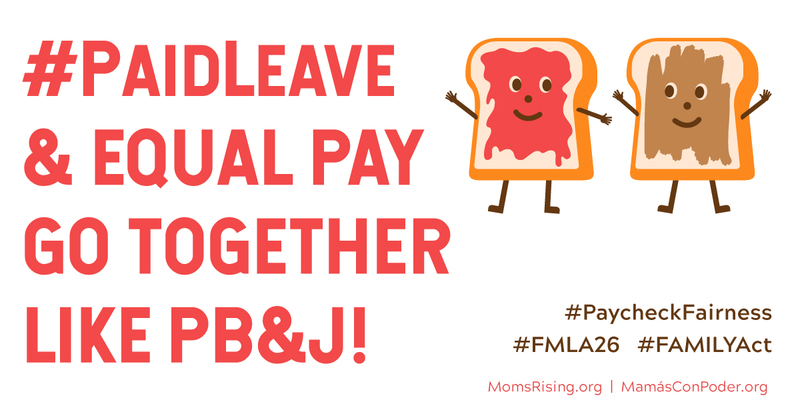 We want at least as many co-sponsors for the FAMILY Act as we have for the Paycheck Fairness Act because like peanut butter and jelly, equal pay and paid family and medical leave aren’t fancy concepts, they’re not luxury items - they’re basics that stand alone, but are better together. The FAMILY Act is an insurance program that would provide workers — including those who are self-employed and/or work part-time — with much-needed income while they, or a family member, welcome the arrival of a new baby or deal with a serious health issue. This new, self-sustaining program would be funded through very small, shared costs to employees and employers. Care is care is care: Whether it’s to care for a newborn you swear already smiles, a mom who is severely ill, or a spouse battling cancer, being there for family is what matters.